Gigabyte did something quite novel with their new G1.Sniper 5 motherboard and unlike most novel things in tech this one is quite useful. The short version is that on the G1.Sniper 5 has swappable op-amps. 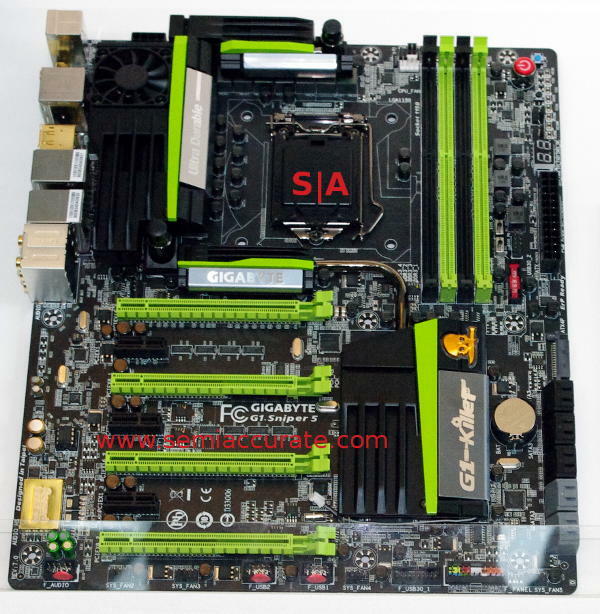 The new G1.Sniper 5 is the latest high-end Haswell board with a Z87 chipset and it is packed with goodies. It has four PCIe 16x lanes via a PLX switch, full digital VRMs from IR, and solid caps. Gold plated power, DIMM, and back panel connectors are rolled in to the Ultra-Durable 5 Plus banner along with all the other goodies from past generations. Normally gold plating gets a sneer from us, but the pins in the power and a few other connectors are visibly more solid than others and the gold plating here is the one area that is actually worth it. This isn’t for show hence the lack of skepticism. Some may argue that gold plating the audio connectors is worth it too but I am not one of those. That said those people are the target market for the G1.Sniper 5 board, and to them it tends to matter a lot. On the audio side there is a Creative Sound Blaster Gold 3D rig and the entire audio system is on a separate power plane. Better yet there is a full op-amp on board that is socketed. Why would you socket it? How about to swap it out with the other one included in the system for a noticeably different sound. If two op-amp variants are not enough Gigabyte will sell you a kit with three more from Burr-Brown, Linear Technology, and Analog Devices along with a handy chip puller for those not willing to soil their fingers. 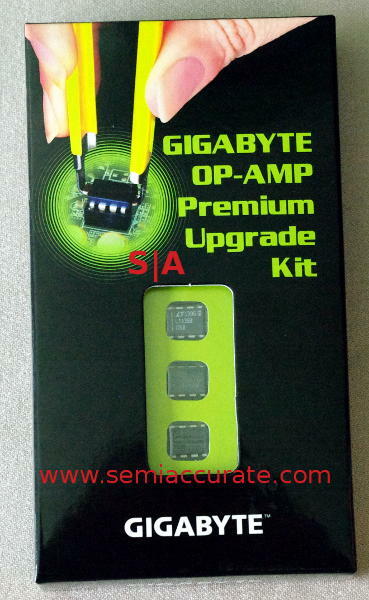 In total there are five op-amp choices to choose from, and based on the demo at Gigabyte they do offer significantly different sound, and all are noticeably better than the non-op-amp sound output. There are two versions of the G1.Sniper called 5 and M5, the M5 being a micro-ATX version vs the full-sized 5. The differences are obvious, a few less SATA ports, USB, and one less slot on the M5 or about what you would expect from a physically smaller PCB. For enthusiasts there is other difference, the heat sink on the chipset and VRMs. The M5 has a big beefy chipset heatsink, the 5 has a bigger beefier chipset heatsink and a massive one on the VRMs. Not only that there is a fan and liquid cooling ports on the 5, both lacking on the M5. Most people don’t water cool or push the VRMs beyond their tolerances and those who do will not worry about space constrained cases either. Gigabyte made the right choice here. One more interesting note is how they wired their USB, there are 10 USB3 ports on the G1.Sniper 5 board, a few less on the M5. Haswell doesn’t support that many ports so there is obviously a USB hub on the board. The first spin of Haswell has a minor bug in the USB3 implementation that can cause streams to fail on wakeup. It will be interesting to see if putting a hub in the middle changes this ‘feature’, anyone know for sure?